Big hit at children's parties with these attractive beautiful dinosaur drawstring pouch goody bags for kids. ✔Each set including 12 different dino designs and 1 bags for each design. 12PCS per set. Each bag has cute kids love digital printing on 1 side and never fade away even after washing. ✔The draw string design makes you store things quickly and take them in and out easily. The fasteners are a high point, they keep the bag shut and make it more suitable for storing things. ✔Made of high quality polyester fabric-super light, super sturdy and water resistant. ✔Perfect for kids or any people with innocence. You can use them as gift to kids or you can use them as casual storage bags for yourself. ✔Can be as portable casual bags, they are really high cost-performance and definitely would be your first choice. ✔We accept OEM orders. If you are seaking some bags with your own designs for a large social activity like marathon donation, holiday christmas gift, please contact us and our professional designer can help making your exclusive printing designs on our bags. All BeeGreen Bags Are Satisfaction Guaranteed! If you have any issues,questions,or concerns.Please don't hesitate to contact us, so we can resolve the issue ASAP. 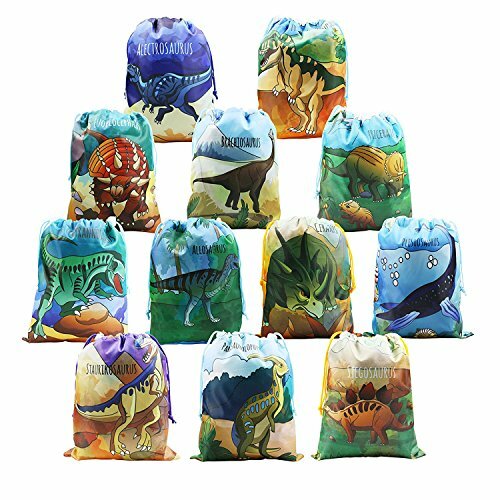 KIDS LOVED DINOSAUR BAGS: 12 pack cute dino bags per set including Alectrosaurus, Tyrannosaurus, Euoplocephalus, Brachiosaurus, Triceratops, Allosaurus, Ceratops, Plesiosaurus, Staurikosaurus, Parasaurolophus, Stegosaurus. Perfect ideas as gifts for children & toddlers dinosaur themed birthday parties. Pair them with a variety of dinosaur figures, eggs, masks, tattoos, stampers, candies for birthday party's, use as wall decorations and other decor to create a Big hit at children's birthday! PERFECT SIZE: W10"*H12"(W25.5cm*H30.5cm), roomy enough to hold lots of party favors including dinosaur toys, gifts, candy & goodies. Perfect as gifts for kids birthday party, baby shower gifts, arts & crafts activity, school class room party, pool party, Halloween, Christmas and camping. STURDY & LIGHTWEIGHT: BeeGreen dino party favor bags are made of 100% polyester fabric. It is a Lightweight fabric that is also very sturdy and withstands daily wear and tear. Super party favor bags to give away for children's parties! MACHINE WASHABLE & REUSABLE: BeeGreen dino party bags are digital printed and can be washed by machine, never fade away, recommend mild detergent and hang to dry! Kids can reuse them after parties to store shoes, clothes, books, lunch box and so on. A Great Replacement for Plastic and Paper Gift Bags ! QUALITY ASSURANCE: Double reinforced stitches for All seams, Color pull string cords and 2 spring loaded fasteners as closure on the top. All BeeGreen Loot Bags are Satisfaction Guaranteed ! If you have any questions about this product by BeeGreen, contact us by completing and submitting the form below. If you are looking for a specif part number, please include it with your message.